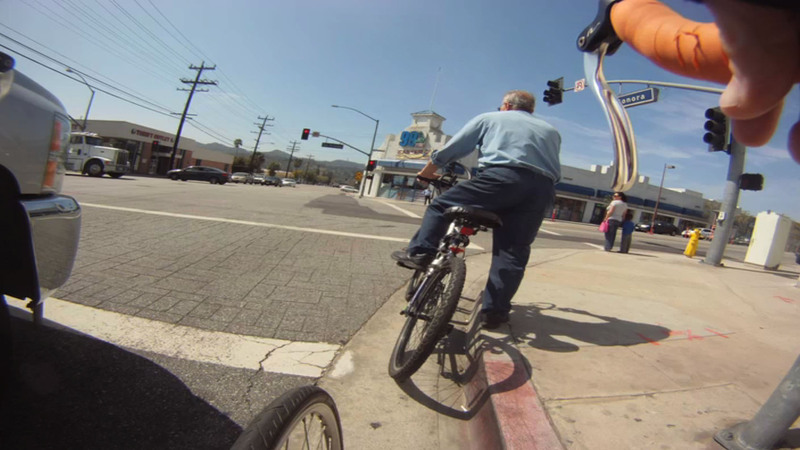 You might recall last week that I got on my trusty singlespeeder “El Naranja” and undertook my first road ride of 2013 by pedaling to the DMV in Glendale and back to purchase a copy of the California Vehicle Code required for my present public safety training module. What I forgot to relate was the negative contact I had with a grumpy-assed old cyclist almost immediately on my way back home. No sooner had I left the DMV when this guy passed me on Glenoaks and I made a right and fell in behind him heading east in the bike lane at a nice plus-10mph clip. Everything was totally peachy for the first block or so and I was happy to see I wasn’t the only one at that moment making use of the relatively new Class II addition to the boulevard, right up until he suddenly came to quick and full put-your-foot-down stop in the lane, as shown below, despite there being plenty of room to ease off to the right like most aware and considerate people would do. 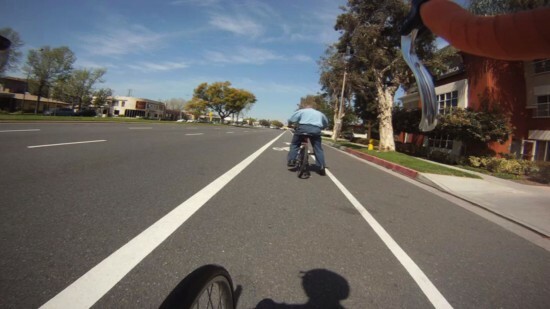 Fortunately I was able make a semi-evasive move that allowed me not to pile all up into his lower intestine and instead move to the left out of the bike lane into the No. 3 traffic lane and safely pass him. In doing so (and while coincidentally aware due to the aforementioned training that it is a violation of CVC Section 21211[a] “to stop, stand, sit, or loiter upon any bike lane, path or trail if the stopping, standing, sitting or loitering impedes or blocks other cyclists”), I offered the suggestion that he really shouldn’t make a habit of doing what he’d just done and then pedaled on up to the intersection of Glenoaks and Sonora where I soon learned that he was none to happy with the advice I’d offered. 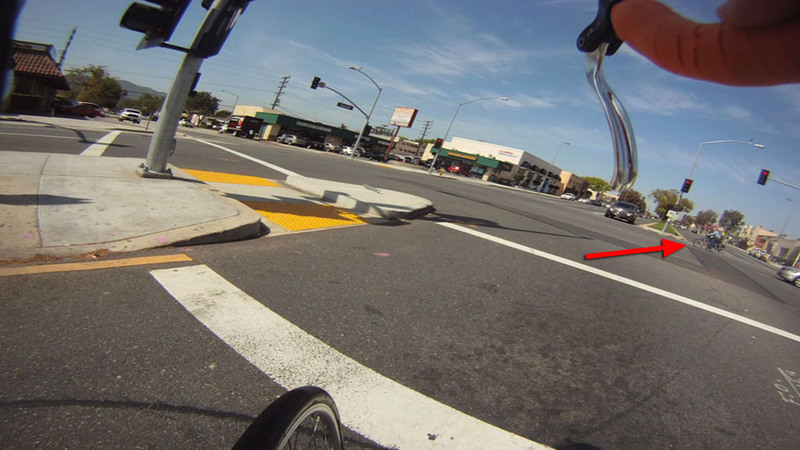 I also include it to to show where I stopped while the cyclist I’d encountered caught up to me. Though he also needed to make a left and go south on Sonora, he opted to execute his turn the old-fashioned 90-degree long way, by crossing Sonora to the opposite corner and then waiting for the green to continue southbound. I personally like to utilize left turn lanes whenever possible for no other reason than to get whatever motorists in my vicinity who don’t know better to perhaps replace their “What the hell is that cyclist doing there breaking yet another law instead of being on the sidewalk where he belongs! 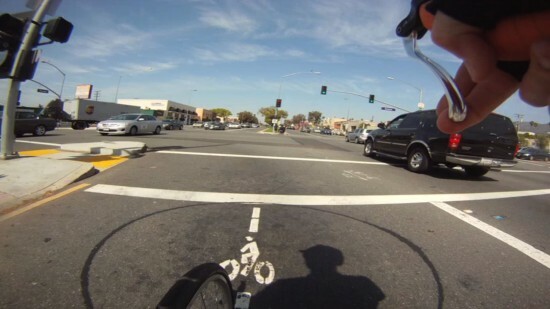 ?” with a realization that it is the perfectly proper and legal way for a cyclist to make such a turn. And I didn’t begrudge this guy his decision not to follow my lead, at least not until he crossed Sonora, pointed his bike south on that far corner, and started jawing at me angrily accompanied by a series of gesticulations that were concluded with the clear pointing of a middle finger in my direction. Of course, you’re way ahead of me. You’ve already figured out that with both of us heading south on the same street, I’d eventually get my green arrow and his headstart down Sonora would quickly evaporate as I reeled him in until we’d once again be in close enough proximity to each other. You’re gooooood! That happened at the next light at San Fernando Boulevard, when I pulled up behind him and cleared my throat loudly enough for him to peek around and know I was now readily available if he wished to continue the conversation. Funny what a difference distance and cross traffic makes to one’s bravado. Maybe age and size, too — with me being a head taller and at least 10 years his junior. From across the buffered safety of a busy intersection this guy couldn’t insult me and flip me off enough. But when I get close enough to count the overburdened stitches in the buttcrack seam of his dark blue Dickies, suddenly he’s got absolutely nothing to say. I’ve been pretty lucky in the number of visual contacts I’ve had with Cooper’s hawks, but for most of us, seeing one doing anything other than circling or streaking across the sky above is a bit of a rarity. The reclusive birds aren’t known for being comfortable in the proximity of people. So you can imagine my surprise when, while watering the side yard, I saw one dive to a branch in the camphor laurel tree in the front yard and then quickly drop down out of view behind the neighbor’s fence. 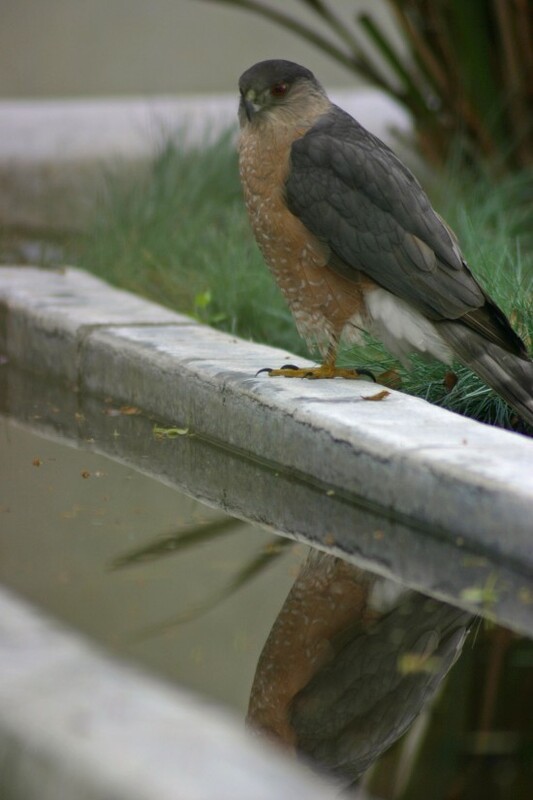 Wondering if it had pounced on a would-be meal, I peered through the slats and was greeted with this incredible view of the aerial predator totally on one foot, totally at ease on the ground — veritably reflective beside the small reflecting pool in our neighbor’s front yard. That’s where knowledge might come in handy. I say “might” because even if you know these are actually beneficial critters to you, they do have a Creep Factor of 15 (based on their pairs of legs), which can cause even the most rational person to run into the arms of the the nearest Orkin Man, or to roll up a gasoline-soaked newspaper, setting it aflame after attaching it to a 10-foot pole and whacking it to death. 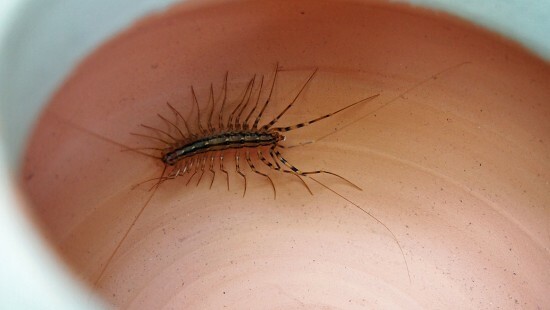 Nevertheless, since it is spring and a high time when you might come across one of these, I shall implore you to administer mercy and restraint upon encountering Scutigera coleoptrata. They aren’t commonly called “house centipedes” because they are from the Planet Crawlazzz. They are there in your domicile helping keep in check the populations of other arthropods that also scurry around your place… assuming you don’t bugbomb it so often that you’ve modified your DNA and started growing additional thumbs. Out of your ears. If a one-inch-long house centipede can run its length 15 times in a second, that’s basically the equivalent of of a 6-foot tall person running 90 feet per second (6 x 15). Need an animal kingdom point of reference? Cheetahs churn up 103 feet per second. Need more? Compare that with the fastest human on earth, Usain Bolt, who holds the world record time of 9.58 seconds in the the 100-meter race. That’s roughly nothing more than a lousy 34 feet per second. See, house centipedes don’t care about you. In fact they are generally considered harmless to humans. But even if one [frightened squeeee!] was to end up racing along your leg, odds are not only wouldn’t it sting you, but if it did its sting couldn’t penetrate your skin. At worst if felt, it would be akin to a bee sting. Instead, what house centipedes care about and hunt are the creepy things that you’re living with — and make no mistake: you are. So remember. If you kill a house centipede, the life you save won’t be your own. It’ll be those of the spiders, roaches, bedbugs, termites, silverfish and ants all around you. After getting my scores last month for the “Work Standard Test Battery” (WSTB), comprised of five timed and scored physical events, I proudly wrote about the progress I’d made between the 17 months that transpired from when I first took it. We do it all again next month, and that WSTB will differ in that these first two were basically practice runs. That one will be our Final. When we do it in April it’ll be pass and continue or fail and get kicked out of the program. Frankly, I’m confident I’ll pass (hell I had more than the required 384 total points to pass when I first did it in August 2011). My goal instead is to beat my March 9 times. In what’s only my fifth ride of the entirety-to-date of 2013 (egad! ), I tripped on over to the Glendale DMV to pick up a copy of the latest edition of the California Vehicle Code. There’s something fulfillingly off-kilter about biking to the Department of Motor Vehicles, which is exactly why I did it, in this case from Silver Lake to the Glendale branch and back, about 17 miles under a wonderful second day of spring. When I discovered a book review last week about “The Searchers: The Making of An American Legend” by Glenn Frankel, I was already ordering it before I read whether the reviewer thought it was good or not. My motivation wasn’t just my unconditional adoration of John Ford’s 1956 masterpiece, starring John Wayne. 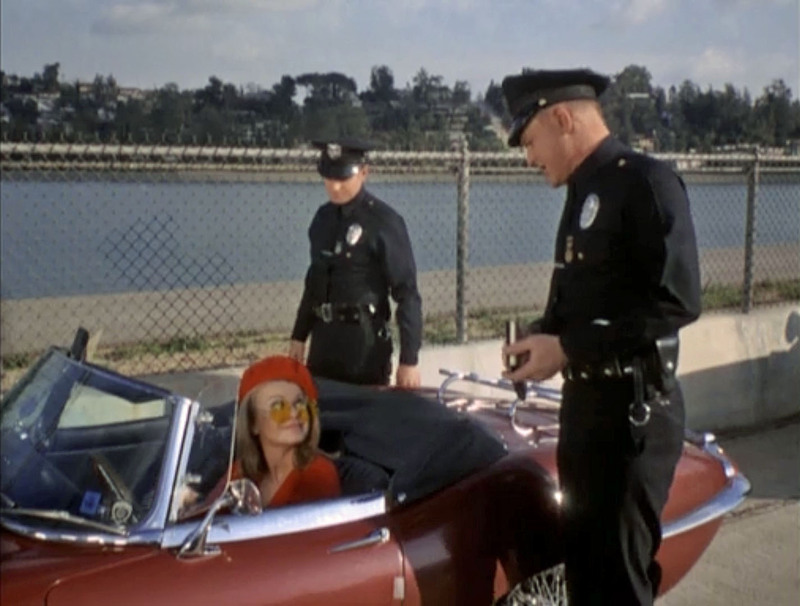 It was also because I was hoping for an answer or at least insight into Ford’s decision as to why he filmed the climactic scene where Wayne’s Ethan Edwards finally catches up to Natalie Wood’s Debbie at Bronson Canyon here in Hollywood. In the film Debbie flees across the barren plains of Monument Valley with Ethan in hot pursuit on horseback. 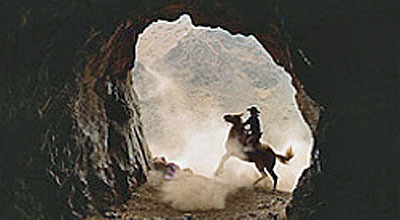 But instead of reuniting them there, Ford quick-cuts to Debbie running up to the mouth of the Bronson Canyon cave/tunnel. Wayne comes charging down the adjacent slope, dismounts and approaches his long-lost niece, undecided still as to whether he’s going to save her because she’s kin or let his hatred of Indians take over and kill her because she’s long assimilated into the native culture she was abducted into as a child. As a local who’s haunted them thar Hollywood Hills since I was a kid, I’ve known about Bronson Canyon since I was in elementary school, and I can remember watching “The Searchers” for the umpteenth time about 10 years ago and finally recognizing it. And yes, during visits since, I’ve gone to the mouth of that cave entrance in full-on fanboy awe knowing that I was standing in the exact spots where The Duke and Ford themselves had stood. One time, while overhearing a trio of visitors talking about the place’s use in lesser vehicles such as “Batman” (the ’60s TV series), “Star Trek VI,” and “Army of Darkness.,” I shared what I knew with them. Sadly, my enthusiastic description of the scene (complete with where Ford set up the camera) was lost because none of the three had seen the classic (which I feel should be a crime against entertainment). I hold the film dearer to my heart knowing part of it was filmed in what is basically the playground of my past and so readily accessible at present. But with so much of the film’s exteriors shot in and around the organic magnificence of Monument Valley (itself a star of the film), I’ve long wondered what happened to bring Ford and Wayne and Wood to film that pivotal scene back here in Hollywood at what is in essence so fake a location entirely incongruous to the established wide-open scope of the West’s great outdoors. As such, I couldn’t resist diving into the back of the book to see if it was there. Thanks to Frankel, I now have the answer and so much more. 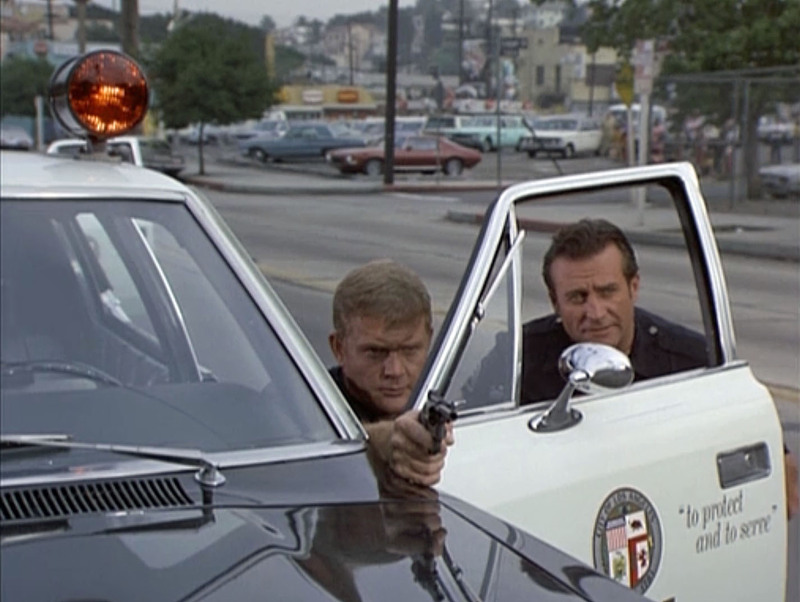 Four days later, Ford took John Wayne, Natalie Wood, and a camera crew to Bronson Canyon to shoot the film’s climactic scene in which Ethan finally hunts down Debbie. The canyon was one of Hollywood’s classic outdoor locations, a former quarry carved into the southwest corner of Griffith Park just a few miles east of the Culver City studio. Brown and barren, it readily stood in for the rocky terrain of the West. From “Riders of the Purple Sage” (1925) to “I Am a Fugitive from a Chain Gang” (1932) to “Zorro Rides Again” (1937), anyone who needed a cheap natural location within a bus ride from a studio had resorted to Bronson Canyon over the years. Ford didn’t go there save money, however, but to solve a problem. As usual, he left no notes to explain. But it’s likely Ford and his crew had filmed the climactic scene in Monument Valley in July according to the [Frank] Nugent screenplay and that Ford had decided at the last minute to change it. The camera holds on Debbie’s face — the eyes gaze fearlessly, innocently into Ethan’. After a moment, he lowers his gun and puts it away. “You sure do favor your moth,” he tells her. Then he extends his hand, puts his arm protectively around her and a reconciled uncle and niece head for home. As he did so many times, Ford threw away Nugent’s dialogue and improvised. The face that he would be jump-cutting from the flat parched floor of Monument Valley to the hilly rock-strewn path leading to Bronson Canyon did not seem to trouble him. 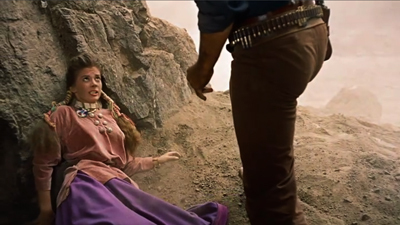 In the filmed version, Ethan chases Debbie down, calling out her name — similar to the way he had called out Martha’s name earlier in the film when he searched for her among the flaming ruins of the ranch house. Desperate to escape him, Debbie reaches the mouth of the cave and then collapses. Ethan dismounts, stands over her, then lifts her over his head in one sweeping motion and takers her in his amrs. “Let’s go home, Debbie,” is all he says. For Ford and his crew, it was a quick visit. They started shooting at Bronson Canyon at 11:00 that morning and finished up at 12:45. They broke a half hour for lunch and then headed back to the studio. Damn. I’ve long been a searcher for that information. I can’t wait to start at the beginning of Frankel’s book and see what else he has to show me about one of the greatest motion pictures ever made. 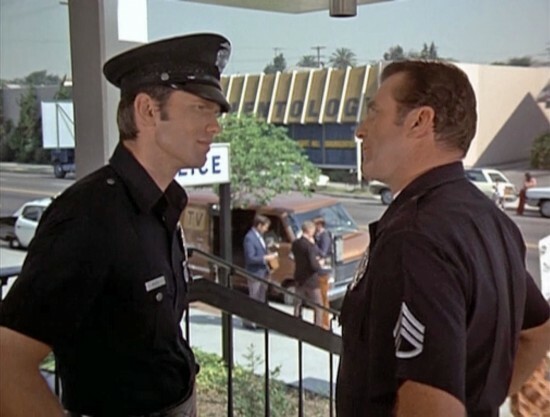 Not sure why, but back when I was growing up I was always so much more an “Emergency!” kid, only occasionally watching the landmark “Adam-12” series (1968-1975). Thanks to Netflix over these last six month or so, I’ve methodically marched my way across every episode of the first five years, and am about three or four into the show’s sixth (and second to last) season on the air. Why? I attribute a fair share of my interest to nostalgia, but also to the fact that it holds up all these years later as a pretty damn good show. Of course, my main enthusiasm for it might have something to do with my present status as a trainee in a public safety program, and for sure whenever partners Pete Malloy and Jim Reed (Martin Milner and Kent McCord) inevitably do wrong by today’s law enforcement training standards, it reinforces how I should do things right. Whether they’re doing person searches before handcuffing, using the old “feet back and spread ’em!” technique, calling for back-up and then not waiting for it to arrive before charging headlong after armed criminals into buildings, or turning their backs on suspects, the dynamic duo never fails to teach me what not to do almost each and every 24-minute episode. There have been plenty of others I’ve recognized (for example, the opening credits of the first couple/three seasons involved the vehicle speeding north on Hoover from 6th Street with historic First Congregational Church in the background and the countless stock shots of the station house), but I’ve been too lazy to screengrab them. If any more show up during the remaining episodes I’ll get into the habit of capturing and posting. UPDATE (03.15): I remembered in an episode from Season Five (1972) during a protest scene staged in front of Rampart Station, the angle of the shot showing McCord and Boyett talking outside the entrance revealed the LAPD had a notable neighbor across Temple Street back then… the Church of Scientology. Interesting that they were as modest about their signage as they are now. You are currently browsing the [sic] blog archives for March, 2013.